Grub Street describes the Waffogato as a ” vanilla ice cream molded into a waffle shape with tapioca pearls and salted Belgian waffle bits,” with a maple-flavored espresso poured on top. It is magical, because the waffle will melt into normal ice cream and people unfamiliar with the laws of thermodynamics will be astounded to see something melt when hot coffee comes into contact with cold ice cream. Is it witchcraft? No! 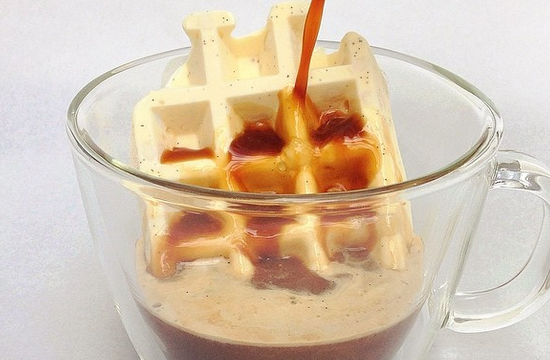 It’s Dominique Ansel putting a waffle into an ice cream into a coffee. But he has broken out of his reputation of being that guy who puts two desserts into one dessert: he’s now the guy who puts two desserts into one dessert and then turns that into a third dessert. WE HAVE TO GO DEEPER, DOMINIQUE.